Fringe is one 2014’s biggest trends and it may be the most fun to wear. Fringe adds texture and movement to your look, no matter how you wear it. From Tamara Mellon fringe skirts you can buy now, to all the draped fringe pieces on the runway at Stella McCartney Fall 2014, fringe is literally everywhere. 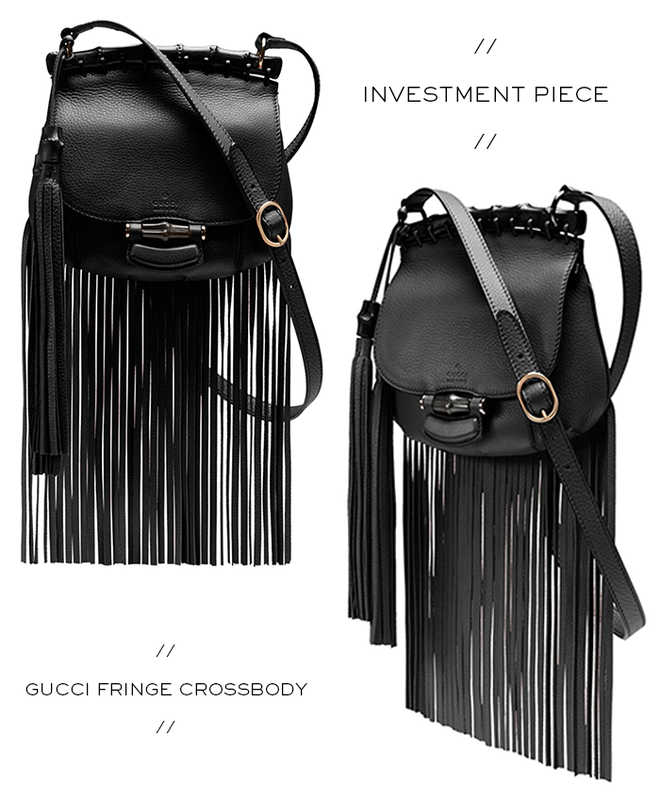 There are obviously fringe pieces out there that are very boho and not really my style, but the sleeker pieces like this Gucci bag and this fringe top are very high up on my wish list. I feel like a fringe bag is a great piece to invest in, simply because it makes a great statement and gives your outfit the perfect amount of flair. Don’t you agree? Shop my favorite fringe pieces below, but click here to shop my most-wanted fringe item this year. Oh la la! I went to the store to check out the bag in person and it was VERY hard to put it back on display. Very, very hard. OH HELLO – i need this in my life!!! PS _ i have a GIVEAWAY going on, stop by and pass on the good karma! Love love love fringe for spring! The bag is perfect.